H T Partnership has extensive experience in preparing professional Reports on all types of property. All Reports are prepared by a Chartered Structural or Civil Engineer. The Structural Survey service we offer is a visual inspection and assessment of the building condition followed by preparation of a Report which forms a Structural Appraisal or Evaluation. The Report details the general construction of the building, provides an experienced Engineer's judgment on the adequacy and condition of the main load-bearing elements, paying particular attention to any significant defects such as: cracks, indications of foundation movement, for example signs of subsidence, leaning or bulging walls, wall tie corrosion, sagging floors or deformed roof structure. These Reports are clear and concise and include recommendations on how to deal with any specific structural problems, for example detailing repairs, strengthening or stabilising remedial work as appropriate. Reports are often required urgently to assist with financial decisions, such as buying and selling properties. Therefore once instructed and subject to access, H T Partnership will visit within two working days, and the Report is issued within a further two working days. Please see left for some examples of problems identified in Structural Surveys. 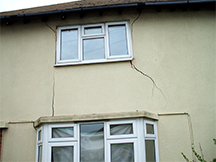 Subsidence of foundations – serious external cracks. 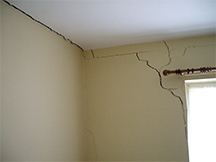 Subsidence of foundations – serious internal cracks. 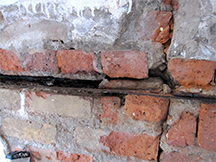 Thermal movement – damage to brickwork. Rusting of steel beam in brickwork. 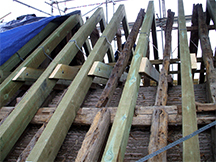 Rotten roof of historic structure supported by new roof.